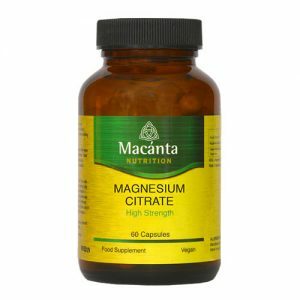 Macánta Magnesium Citrate gives you highly absorbable magnesium, which is required by every organ of the body. Vital for regulating calcium transport and absorption, magnesium is stored in the bones and organs where it can be used when needed for a number of essential functions. Magnesium plays a part in and helps with the balance of electrolytes, the functioning of the body’s metabolism and normal protein synthesis. Magnesium also helps to regulate the levels of calcium, copper, zinc, potassium, vitamin D, and other important nutrients. As a food supplement for adults, take 1-2 capsules per day, preferably in the morning and/or evening.